Top from left: Martin Walsh, Maura Healey, Joseph Kennedy III. Bottom from left: Jeffrey Bussgang, Setti Warren, Seth Moulton, and Kim Driscoll. Wanted: a relatively young candidate with a big, well-articulated vision for Massachusetts, a bright spark of personality, and big dollop of charisma. Women, minorities, and veterans encouraged to apply. For Democrats still stinging from Martha Coakley’s gubernatorial loss to Charlie Baker last week, democracy has a built-in salve: There will be another election in four short years. And already — quietly — they are beginning to mull who might run in 2018, a proposition that will be dozens of months, hundreds of events, and millions of dollars in the making. They will be looking for someone who can inspire the progressive base of the party, bring a fresh outlook to voters, and offer a clear idea of where they want to lead the state, according to interviews with more than a dozen Democratic operatives, strategists, and activists in Massachusetts. 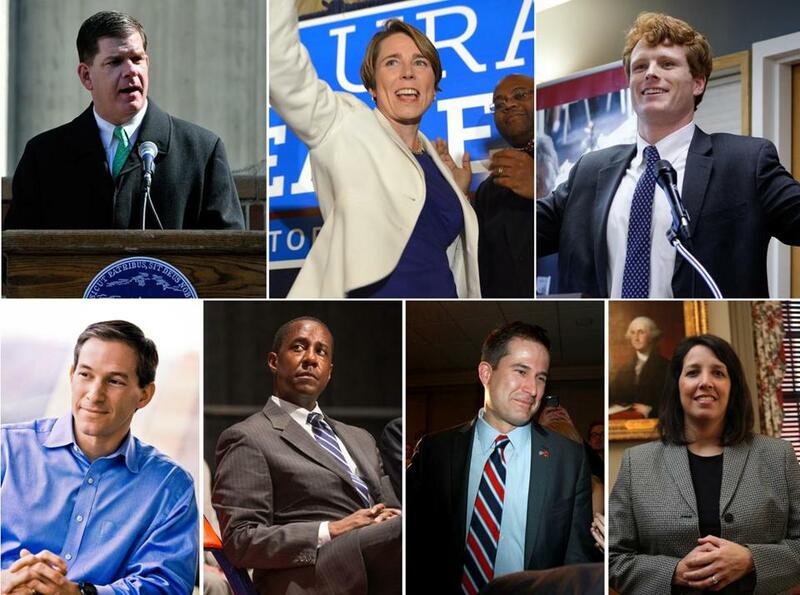 The first name on many Democratic lists is Attorney General-elect Maura Healey, seen as possessing most of the attributes a contender for the state’s highest office must have. In particular, she has the intangible likability factor that can make or break a bid. Other names floated include current mayors, such as Joseph A. Curtatone of Somerville and Kim Driscoll of Salem; a rising-star state senator, Benjamin B. Downing of Pittsfield; and — following in the mold of Governor Deval Patrick in 2006 and US Senator Elizabeth Warren in 2012 — some people who would come from outside the realm of elected officials, such as venture capital investor Jeffrey J. Bussgang or Richard A. Davey, a former state transportation secretary. Age is a key factor: With few exceptions, the might-be hopefuls are all currently under 50. Healey, a 43-year-old Charlestown resident, built up a strong network of grass-roots support and won a decisive victory over a more established candidate, former state senator Warren Tolman, in the Democratic primary earlier this year. A former professional basketball player and assistant state attorney general, she is charismatic and can be a forceful public speaker. Healey, who is openly gay, also has a key ability for any aspirant for higher office: She can raise money, having pulled in more than $1.5 million in her successful bid to succeed Coakley as attorney general. A Healey spokesman, David Guarino, worked to tamp down any 2018 speculation. “Maura is focused on one job, and that’s being attorney general,” he said. Mayors, who have executive experience and records of municipal accomplishment, are high on the list of might-be gubernatorial contenders, including Curtatone, Driscoll, and Setti Warren of Newton. Curtatone, 48, first took office in January 2004 and is seen as overseeing something of renaissance in a once-gritty, now-hip city. Driscoll, 48, is seen as having strong budget-balancing chops, and first took office in January 2006. Warren, Newton’s first African-American mayor and an Iraq War veteran, has already made a brief statewide bid — for US Senate in 2011. Operatives speculate the 44-year-old might be open to another run for higher office down the line. Another mayor inevitably included on most 2018 lists is Martin J. Walsh of Boston. He is up for reelection in 2017, and many operatives believe the 47-year-old will stay focused on the city for at least two terms before considering a statewide bid. Walsh spokeswoman Kate Norton said in a statement that he is focused on his job. “It’s a little premature to speculate on possible opposition for a governor that has not yet been sworn in,” she said. To be sure, four years is many lifetimes away in politics. Will the Democratic base yearn for a rousing progressive rhetorician who draws hearts and hopes skyward? Or will it seek a moderate, competent course-setter, with aims closer to earth? And how Baker performs — not to mention how the state’s economy does — will shape the contours of the Democratic field that emerges against him, assuming he runs for a second term. Downing, the state senator, who is 33, is already well-versed in attacks on Baker, having served as the chairman of the state party’s coordinated campaign, the statewide effort to boost Democrats in races at all levels. At least two members of the congressional delegation also made most lists. US Representative Joseph Kennedy III, 34, is seen as a candidate who would start a gubernatorial bid as a strong front-runner. But operatives see Kennedy focused on building up seniority in a place where that matters and, perhaps, considering a run for US Senate years down the line. Congressman-elect Seth Moulton, a 36-year-old Marine veteran who will represent the state’s North Shore-anchored district, is also seen as a potential contender for governor. Former gubernatorial aspirants also were mentioned, but analysts see a steeper climb for retreads and older candidates who might take the plunge. “The next governor is not going to come from my political generation,” said Michael Goldman, 65, a longtime Democratic consultant, who advises Healey and Walsh. Activists and insiders ponder that someone outside the realm of elected officials might be a good bet for 2018. Those people could, they say, avoid the attack of being labeled Beacon Hill insiders and excite the base of the party. “I firmly believe we sometimes overlook the great potential of outside candidates because we’re too entrenched with those who pay their dues within the realm of the party,” said Mary Pat Akers, a longtime Democratic activist from Great Barrington, who is deeply involved with politics in the Berkshires. Names floated in that category include Bussgang, 45, a venture capital investor and lecturer at Harvard Business School, as well as former Patrick administration officials, such as Davey, 41. Of course, the Democratic challenger to Baker may well be someone on nobody’s lists or lips. After all, in 2002, four years before his first run, few were talking about a little-known former Clinton administration lawyer named Deval Patrick.